For those people on a course with us, your equipment hire is included in the price. However, if you’re not on a course but are in need of kit, we may be able to help. For those people on a course with us, your equipment hire is included in the price. Your instructor will bring you in to stores to loan anything you need at the beginning of the course. However, if you’re not on a course but are in need of kit, we may be able to help. Here in stores, we have various items available to borrow at a small cost. Payments are taken at point of issue, are non-refundable and we ask that you to bring a security deposit, usually a driver’s licence or photo ID. From this, we will record your name and address as a form of contact should we need to contact you. You will also be asked to sign a short loan agreement. Stores closes at 5:30pm, but if you’re back any later than that, our reception is open much later and they will be able to open up, return your deposit and check in the kit. If you have any problems, please feel free to contact us and we will do our very best to help you out. We can offer the following for general public hire. All prices are per item, per 24 hour loan period. *Due to the requirements of personal protective equipment, loan items are limited to the list given above. During the winter season, we also offer the hire of some basic winter equipment. You’ll need to be proficient in the use of winter kit. If you’d like to receive training in its use, check out our range of winter mountaineering courses first. 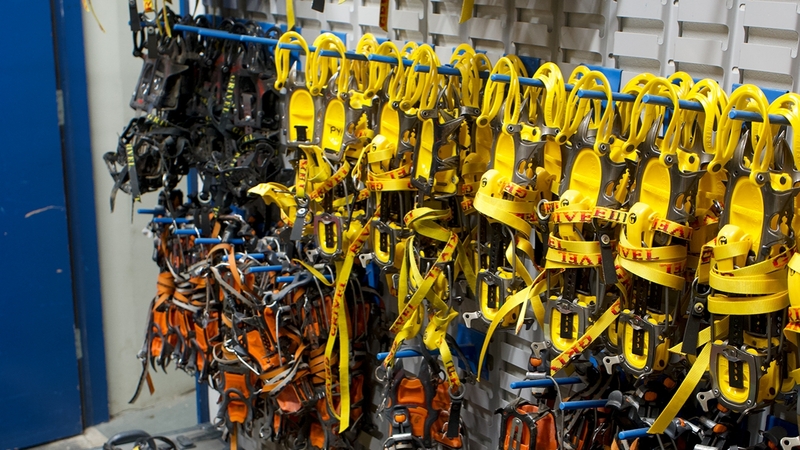 Often, you can use your own boots and we can assist with the fitting of crampons to boots but we do reserve the right to refuse to loan crampons if the boots are not suitable. Again, all prices listed are per item per day and items are subject to availability. *This is an extra service we offer and not our primary purpose in stores so we ask that you give us time to kit out our own clients first. Therefore, we ask if you can come in after 10am on Mondays and Saturdays and after 9am every other day. While this may make you a little later for your day out, it means we can ensure our customer’s needs are met first. ** All loans are subject to availability on a first-come-first-served basis.